The Russian President’s visit put off by a few days because of difficulties in matching the two sides’ diplomatic calendars. Russian President Vladimir Putin, who was believed to travel to India in October 2012 for the 13th annual Indo-Russian summit, will now be visiting India in November, Indian diplomatic sources told RIR. The change in the Russian President’s plans has nothing to do with reports in the Pakistani media that Putin will be making a maiden visit to India’s neighbour in the middle of October 2012. The Pakistani media has given extensive coverage about Putin’s upcoming visit to Islamabad and analysts in that country have described it as a sort of game-changer considering that no Russian President has ever visited Pakistan before. Significantly, there is no official confirmation of Putin’s visit to Pakistan as yet. Sources point out that even if the visit were to materialise, it won’t be a bilateral visit as Putin would be going to Pakistan, if he were to go there eventually, for attending a quadrilateral summit, also featuring Afghanistan and Tajikistan. The last quadrilateral summit was held in 2011in Dushanbe, the capital of Tajikistan, where the four nations called upon the United States-led NATO forces to have a set-up of fully trained local forces in place before they pull out from Afghanistan. Sources said Putin’s India visit has been deferred by “a few days” because of difficulties in matching the two sides’ diplomatic calendars. 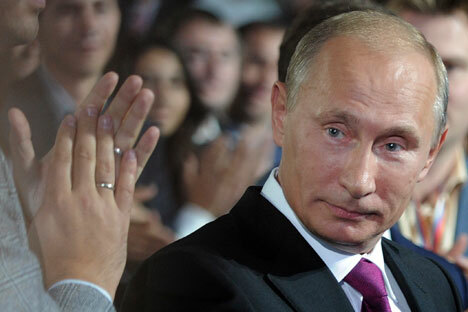 Now Putin is expected to visit India in the first week of November 2012, maybe on November 1. A lot of important issues will be on the table when Putin holds delegation-level talks with Indian Prime Minister Manmohan Singh. However, the most sensitive and controversial issue will be that of Kudankulam Nuclear Power Project (KNPP), being built with the Russian help. The first two units of the project in the southern Indian state of Tamil Nadu are ready. Each unit has the installed capacity of 1000 MW and has cost US$2 billion. The problem is with KNPP’s Units 3 and 4 which the Indian government has already put on the fast-track mode. Units 3 and 4 have become a major challenge for Indian and Russian diplomats today. The Indians have told the Russians that Units 3 and 4 will be covered under the Indian liability laws with regard to a possible nuclear accident. The foreign vendors involved in nuclear power projects in India will be required to shell out up to US$ 500 million in damages in case of a nuclear mishap, according to the Indian nuclear liability laws. The Russians argue against this. Moscow says it “grandfathered” the KNPP way back in 1988 and therefore units 3 and 4 of the project have to be kept out of the liability laws just as units 1 and 2 of KNPP are. The Indians’ counter-argument is that if they were to make an exception for the Russians in this case, it would create problems for the Indian Government vis-a-vis the Americans and the French, who are visibly upset with the new Indian nuclear liability laws. The diplomatic corps of the Russia and India are believed to be racing against time and efforts are on through diplomatic channels to work out a mutually agreeable formula on this thorny issue. Another important highlight of Putin’s India visit is going to be the FGFA (Fifth Generation Fighter Aircraft) project, a joint Indo-Russian project that will cost $35 billion to the two sides on 50:50 basis. The ambitious project entails joint production of one thousand aircraft over the next four decades, two hundred each for Russia and India and six hundred for sale to other countries. A Memorandum of Understanding (MoU) has been signed between India’s Hindustan Aeronautics Ltd (HAL) and Russia’s Rosoboronexport and Sukhoi. If all goes well, a formal agreement on FGFA project may be signed between Putin and Singh during Putin’s upcoming India visit, sources said. The commercial relations between India and Russia are strengthening steadily over the past few years, evidently a result of the Indo-Russian Inter-Governmental Commission on Trade, Economic, Scientific, Technological and Cultural Cooperation (IRIGC-TEC) set up in 2007. The bilateral trade has been growing steadily – from US$ 7.5 billion in 2009, to US$ 8.5 billion in 2010 and to US$ 8.9 billion in 2011 and is expected to cross US$ 15 billion in 2012.